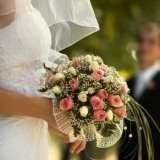 Purple wedding flowers can help brighten up your big day, and they are typically available year round. They can stand on their own as part of a purple wedding theme, or they can help to accent whatever style or theme you are choosing for your wedding day. Perhaps purple is your favorite color, or it is the color of your favorite sports team. Whatever the reason purple flowers are beautiful, and they are sure to draw the attention of your guests. Try combining them with flowers in accent colors like white and yellow, or choose varieties of purple flowers that include these accent colors. 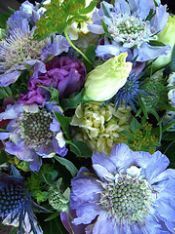 Another option is to only use flowers in different shades of purple, violet and lavender for your bouquets, decorations and centerpieces. Pansies come several solid shades of purple and lavender. 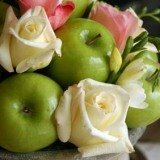 Varieties are also available with accent colors like white and yellow which make them easy to match up with complementary flowers in bouquets and wedding centerpieces. Tulips are gorgeous flowers that can stand on their own. Use them by themselves for centerpieces, but be sure to take extra care because they are not as durable as other flowers in hot climates. The perfect option for a wedding theme, daisies are the favorite flower of many people. Use purple in combination with other daisy colors to make stunning reception decorations. Related to sunflowers, aster works perfectly paired with them for a late summer fall wedding. You usually don't see them by themselves, but they work perfectly as accent flowers for bouquets and other flower displays. 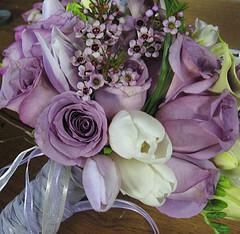 Always a wedding favorite, roses come in different shades of purple and lavender. Try sprinkling the petals on your reception tables around your centerpieces and have your flower girl throw them as she walks down the isle before you.